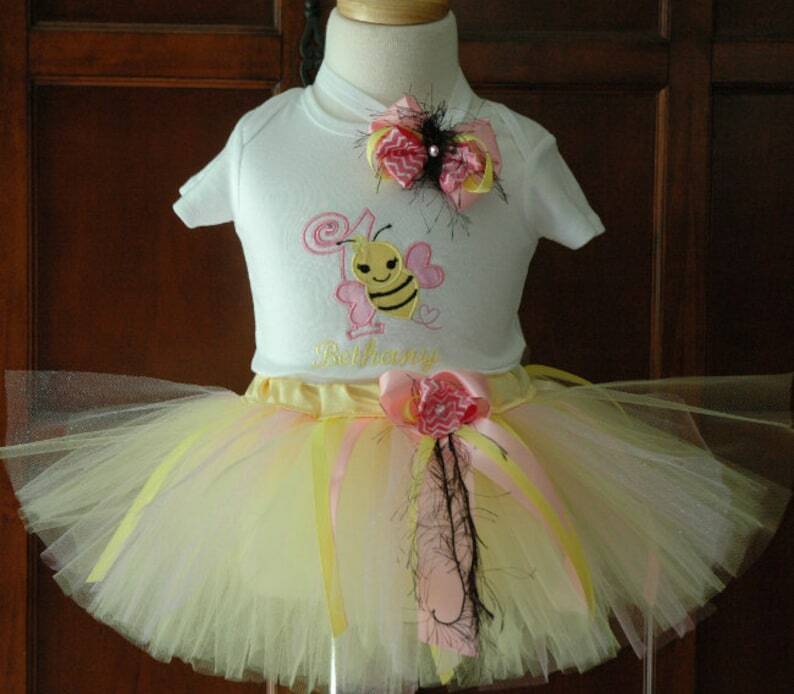 Bumble Bee Yellow and Pink Girls 1st Birthday Tutu Outfit. Perfect for your Little Princess's 1st Birthday Party!! Fun and Whimsical Baby Girls 1st Birthday Honey Bee Tutu Outfit ! Handmade Tutu skirt and embroidered shirt for the best quality. Free name embroidery just let us know your child's name at checkout. Set includes Tutu, onesie and headband with bow. Tutu will be made with lots of yellow and pink and sparkly pink tulle. Sewn and the waist with a yellow satin fabric for comfort. The onesie will be machine embroidered with a whimsical honey bee and a number 1 next to it. Your baby girls name will be embroidered just as you see in the picture right underneath the honey bee. Boutique bow will be hand cut and hand sewn. There are no wires in this beautiful and safe bow finally it will be hand sewn to an elastic headband.